The SaeboGlove has been used by thousands of patients around the world. CHARLOTTE, N.C. - July 6, 2017 - PRLog -- Saebo, Inc., a medical device company specializing in affordable and novel clinical solutions designed to improve mobility and function, announced on Thursday a new patent awarded for the SaeboGlove, a hand rehabilitation product launched in the Summer of 2016 that has since gained international attention as one of the most effective and comfortable hand solutions on the market. The SaeboGlove is designed to help patients suffering from neurological and orthopedic injuries incorporate their hand functionally during therapy and at home. Its proprietary tension system extends the fingers and thumb after grasping an object. The SaeboGlove is lightweight, low-profile, and features a secure, spiral forearm design and a non-slip silicon liner and fingertips to improve traction and maintain proper alignment. The device is based on the latest advances in neurorehabilitation research documenting the brain's ability to "re-program" itself through mass practice, task-oriented arm training. 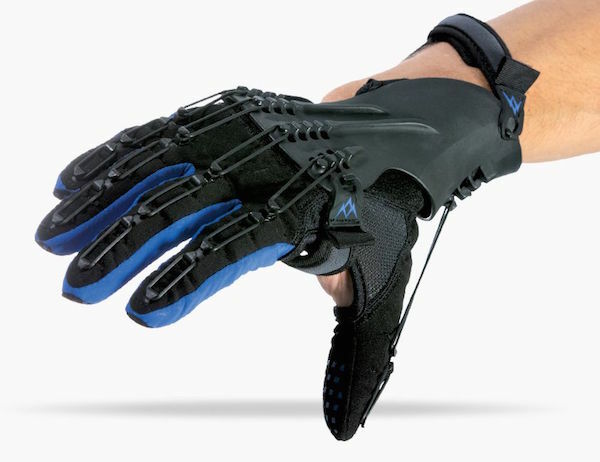 Saebo developed the SaeboGlove after many years of success with their flagship product, the SaeboFlex, another hand recovery device designed to assist in extension of the fingers. The SaeboFlex is a higher-profile device made from durable rigid parts used to support and assist individuals with increased spasticity. The new SaeboGlove device offers a lower profile version, designed specifically for clients that exhibit mild tone or less. Many patients often "graduate" to the SaeboGlove after several months with the SaeboFlex. "The research is clear that clients with limited hand function do not use their affected arm enough throughout the day," states Saebo co-founder Henry Hoffman. "This lack of use curbs further progress and sets the clients on a path for a plateau in their recovery. In the past, Saebo was able to address this concern by offering the SaeboFlex which allows moderately to severely impaired clients to use their hand for grasp and release tasks and exercises. With the addition of the SaeboGlove for mildly affected clients, we now have 2 options available for stroke hand recovery." "Saebo's mission is to provide affordable and accessible break-through home recovery products that will assist with mobility and function. For under $300 USD, many clients will now have the ability to not only use their hand functionally, but reverse the impairment. No other hand stroke technology for that price exists on the market today." The SaeboGlove has been used by thousands of patients around the world, and is recommended by therapists for anyone who experiences hand weakness following a neurological or orthopedic injury. The SaeboGlove is available in multiple sizes, can be ordered online, directly from the Saebo website (https://www.saebo.com/shop/saeboglove/), and does not require a prescription from a doctor; however, it is recommended that the patient consult with a licensed therapist before ordering the device. Saebo, Inc. is a medical device company primarily engaged in the discovery, development and commercialization of affordable and novel clinical solutions designed to improve mobility and function in individuals suffering from neurological and orthopedic conditions. With a vast network of Saebo-trained clinicians spanning six continents, Saebo has helped over 250,000 clients around the globe achieve a new level of independence. For more information about Saebo, please visit: www.saebo.com.